According to Wikipedia Kanchipuram, Kanchi, or Kancheepuram (Tamil: காஞ்சிபுரம்) is a temple city and a municipality in Kanchipuram district in the Indian state of Tamil Nadu. It is a temple town and the headquarters of Kanchipuram district. In ancient times it was called Kachi and Kachiampathi. Kanchipuram is located on the Palar river, and known for its temples and silk sarees. There are several big temples (including some of the greatest Vishnu temples and Shiva temples of Tamil Nadu) like Varadharaja Perumal temple for Lord Vishnu and Ekambaranatha temple which is one of the five forms of abodes of Lord Siva, (it is the earth abode here, other abodes include Chidambaram (Sky), Sri Kalahasti (air), Thiruvanaikaval (water) and Tiruvannamalai (fire)), Kamakshi Amman temple, Varadharaja Perumal temple, Kumara Kottam, Kachapeshwarar temple, Kailasanathar temple and many more. Kanchipuram is also called as “City of 1000 Temples”. Kanchipuram is also famous for its silk sarees, which are hand woven. The term “nagareshu Kanchi” in the above verse attributed the famous Sanskrit poet, Kalidasa, means that Kanchi was the best amongst the cities of medieval India. Kanchipuram is one of the oldest cities in South India, and was a city of learning for Tamil, Sanskrit, and Telugu, and was believed to be visited by Xuanzang (Hsuan Tsang). It was during the reign of Pallava dynasty, from the 4th to the 9th centuries that Kanchipuram attained its limelight. The city served as the Pallava capital, and many of the known temples were built during their reign. The founder of Zen Buddhism, Bodhidharma was born here, as was the famous Sanskrit writer Dandin. The king of Kanchi, Pallava Mahendravarman I was a great scholar and musician, a man of great intelligence and also a great Sanskrit satirist and playwright. Xuanzang, the great Chinese traveler, visited the city in the 7th century and said that this city was 6 miles in circumference and that its people were famous for bravery and piety as well as for their love of justice and veneration for learning. He further recorded that Buddha had visited the place. As regards learning, Kanchi stood second in glory only to Banaras. The history of Kanchi can be traced back to several centuries before the advent of the Christian era. The place finds its name in Patanjali’s Mahabhashya written in the second century BCE Manimekalai, the famous Tamil classic, and Perumpanatru Padai, a great Tamil poetical work, vividly describe the city as it was at the beginning of the Christian era. Pattupattu, one of the sangam literatures records that the king Thondaiman Ilandirayan ruled this town around 2500 years ago. From the 3rd to the 9th century CE Kanchi was the capital of the Pallavas who ruled over the territory extending from the river Krishna in the north to the river Kaveri in the south. The Pallavas fortified the city with ramparts, moats, etc., with wide and well laid out roads and fine temples. They were a great maritime power with contacts with far-off China, Siam, Fiji, etc., through their chief Port Mamallapuram, the modern Mahabalipuram (now renamed again as Mamallapuram). The Cholas ruled this town from 10th century to 13th century. Kings of Vijayanagara dynasty ruled from 14th century to 17th century. The temple tower, 192 feet height in Ekamabaranadhar temple and 100-pillar mandapam (building) in Varadaraja Perumal temple in this town are famous for the architectural techniques of Vijayanagara dynasty. Kanchi was a major seat of Tamil, Sanskrit, and Telugu learning as well as an important place of pilgrimage for Buddhists, Jains and Hindus. Once the seat of learning and religious fervour started its climb down from the Mughal invasions followed by three centuries of colonial rule under the British. Bodhidharma (A.D. 520), who went to China to spread Buddhism, is said to be from Kanchipuram. He stayed at the Shaolin Monastery and preached Buddhist ideologies. At that time he trained the local people in the art of Varmakkalai. The art underwent many changes and came to be known as Shaolin kung fu or boxing. In Japan it came to be known as karate and judo. But it is interesting to note that the Chinese school agrees with the southern school of this art in that it has the same 108 varma points. Kanchipuram is also the seat of the Kanchi maţha (Kanchi Mutt), a hoary Hindu institution that became influential and famous under the leadership of Shri Chandrashekarendra Saraswati. This maţha says that Adi Shankara settled in Kanchipuram after establishing four Āmnāya maţhas in the four corners of India and that this gave rise to the Kanchi maţha. 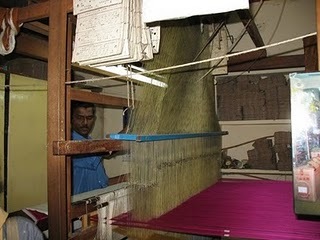 Today, apart from its temples, this small town is also known for its thriving handloom industry. Kanchipuram town is also known as Silk City since the main profession of the people living in and around is weaving silk sarees. More than 5,000 families are engaged in this craft. Kanchipuram in history was also been known as the ghatikasthanam or place of learning. Today several educational institutions offer courses in engineering, arts and science, and medicine, in and around Kanchi. Notable among them is Meenakshi Medical College and Research Institute located near Enathur, about 6 km from Kanchipuram. Since the Meenakshi Medical College was established in 2003, it has developed into a respectable institution of medical education. The Meenakshi hospital, which handles over 1000 outpatients every day, was established with modern infrastructure and facilities and provides service to many people in this area. Asia’s biggest International Library is located at Sri Chandrasekharendra Saraswathi which is a part of Kanchi Mutt. This also runs the Sri Sankara Arts and Science college and Sri Chandrasekharendra Saraswathi Engineering College. Kanchipuram is a major temple city of Tamil Nadu. Vishwakarma Brahmin Sthapathis have shown their excellent architecture cognizance in planning the architecture and sculpting the numerous temples at Kanchipuram. The list gives the consolidated list of temples in and around Kanchipuram revered by the hymns of Alvars as well as Saiva Kuravars or Nayanmars.